I'm pretty pleased with this knit, its not quite a scarf but simple and fast and not really reliant on knowing measurements (great gift knit, destined as part of my sister's holiday gift). The lace is easy to memorize (despite the fact I almost knit the entire lace panel incorrectly and had to rip and restart...) and once you get past the lace, the stockinette just flies. I knit the s/m size (2nd size for the pattern), and used barely BARELY under 3 skeins of yarn. I did do some mods to keep it the length pictured in the pattern/shorter than the pattern for this size indicated, so I'd say if you were knitting it as written you'll definitely need 4 sk (and also makes me think that the pattern's yarn estimate is incorrect-- the Debbie Bliss Aran Tweed is the same weight & yardage as the Noro Silk Garden (DB: 109 yd/50 gm, Noro: 110yd/50gm). I knit the pattern as written til the first decrease row. After the first decrease, I knit the next 2 decreases every 6 rows (instead of every 8). Then for the 4th, 5th & 6th (final) decreases, I knit the decrease row every 4 rows. The final length I came up with was 13" before I started the k1p1 collar, which was knit as written (and which I should have folded over more in the wearing-pics). As written, the pattern would have had an extra 18 rows of stockinette (6.5sts/column inch), it would have been about 3" longer (and used more yarn). I don't think the thin striping of the Silk Garden detracts from the lace panel, but to be honest the lace isn't the attraction of the pattern for me (its nice...) but the whole "victorian" look of it, and how its sorta an anti-scarf. Not saying other family members aren't getting scarves this year, but this is a little different and I think will look great on my statuesque sister. My to-be-felted colorwork sampler bag! 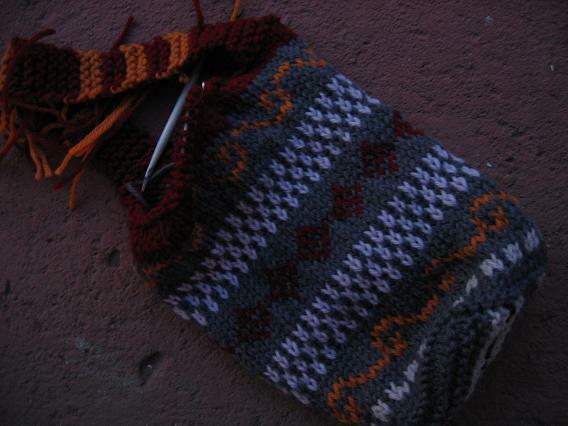 Knit with, get this, 2 colors held in my right hand! Pleased as punch, and it wasn't nearly as frightening as I had made it to be in my mind. I'd done a little colorwork before, but always dropping yarn and picking it up-- this way is SO much faster, and more even too. qThe capelet is gorgeous! I love the colorway! Great work! I almost bought that yarn at Little Knits -- it's nice to see it used, since the color seemed to vary in the online photos. The capelet looks awesome! Good job you! And so fast too. Your colorwork looks so perfect, it doesn't even look like you need to felt it! Very nice -- it does indeed have a Victorian taste to it. I'm envious of your colourwork. It always gives me conniptions. I think the striping of the Silk Garden allows the lace a more muted modern look while still retaining the Victorian shape. Nice job! The capelet is gorgeous! I've printed off the pattern, and your mods, for future knitting. The caplet is wonderful. I think the Silk Garden is a perfect choice. You've got me thinking that would be a good choice for my sister for Christmas. Thanks for the idea. Your colorwork looks really great. Two yarns in the right hand? That sounds like my kind of knittin'. Gorgeous capelet! Love the colorwork bag -- I've never done much along that line. I still hold one color at a time. I usually avoid colorwork. Maybe I should learn to hold the colors in my hand so it wouldn't be so bad. Gorgeous capelet. 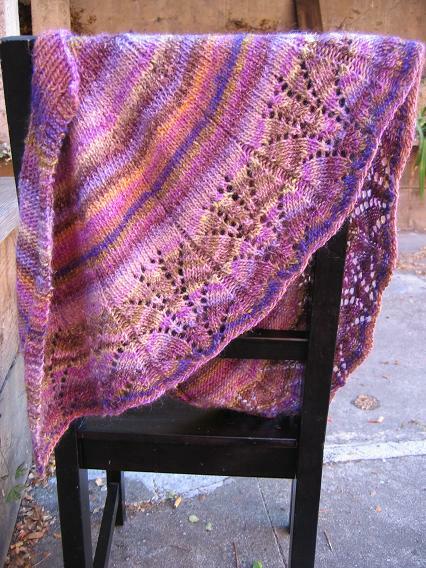 I am knitting a sweater in silk garden so your comments on it are especially helpful. WOW! and WOW! and WOW! Stunning! Great colorwary and pattern! Gorgeous! Silk Garden really is lovely stuff. The capelet is very nice. I really like the colors and the pattern. 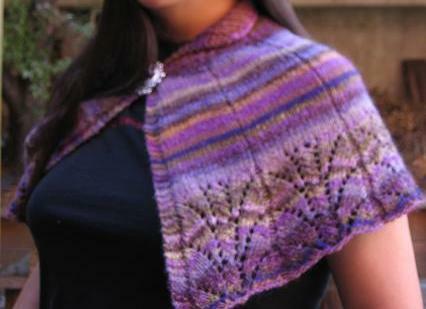 The caplet came out great - your mods and the silk garden made for a great FO! you'll have to snap some photos of how you weave in ends as you go - I'd love to know! I LURVE the capelet! It's beautiful! Sigh....I need to get so much better at colorwork....might be time for me to take a class, too. Ooh I love the capelet! Wouldn't it look adorable layered over a navy peacoat this winter? The capelet is so pretty! Ouch on the overknitting with the Lizard Ridge. If I did that, that'd all I'd be thinking about during the home stretch. "If only I hadn't knit two extra squares, I'd be done by now!" Nice work great color choice! Thanks for the heads up. Silk Garden is a good yarn for the stash--I can think of dozens of uses for it. Beautiful capelet - I love the colors! The colorwork class sounds great - wish I had something like that here. I decided to make this as a gift for my cousin who is going through her last leg of radiation for Breast Cancer. I fell in love with this out of the Noro, it is sooo pretty. I hope it is not to complicated for me to work. I am a new knitter with not very much pattern experience. I guess the only way to get your feet wet is to jump in eh?! I wish I was a capelet wearin' kind of girl because that is gorgeous. 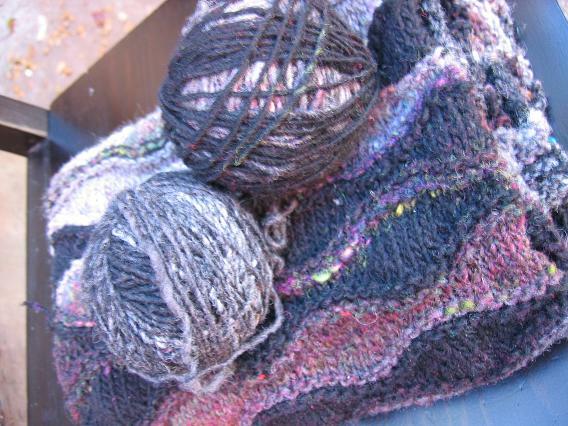 I have some Noro Silk Garden Lite that I'm using for ... socks. 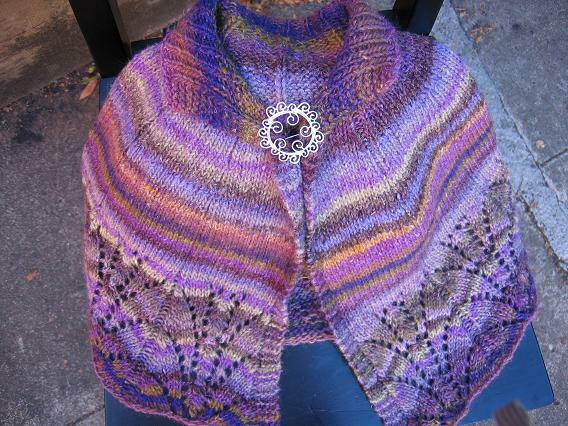 Gorgeous capelet and now I want Lizard Ridge even MORE! The capelet is gorgeous. I would never have thought to use something stripey with a lace portion, but it looks awesome. 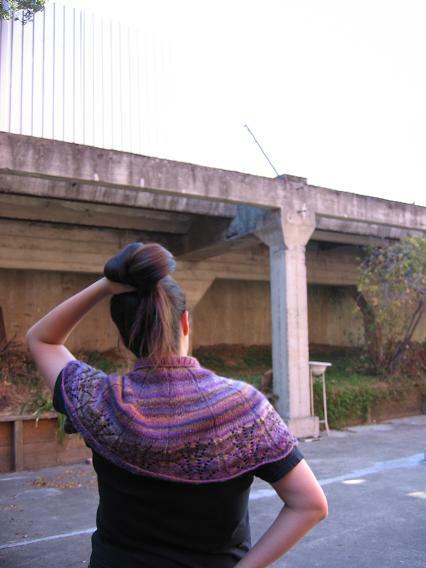 Excellent color choice and great knitting on the capelet -- it outshines the original in the mag!